Are you a glutton for detail no one will ever see? I guess that many of us have programed ourselves to want more of a good thing, and perhaps also to not know when we have enough. There's security in having more than we need, in the stored hoard, in the squirrel's stash, for when the expected unexpected comes to pass: we crave reassurance that we'll get by and be equipped to take any situation in our stride. There's a glut of reality TV shows at the moment that deal with those who fill their house with collections of junk and precious belongings. 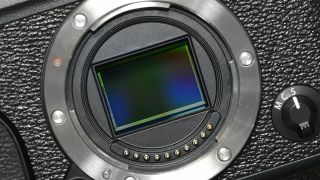 Do we act in a similarly illogical, paranoid and pathological manner when deciding how many pixels we need in a camera? In reality, we only actually NEED around 6-millon pixels to take decent picture. Indeed, some of us remember a time not so long ago when we were grateful to aspire to owning so many. The sensor-population we need to accomplish what our style of photography requires or, more accurately, what the means we use to display our pictures demands, is a different matter. There is no factual figure that determines when we have enough, as we all use our pictures in different ways, but if we are honest with ourselves and look with open eyes at what we do, we will easily see at least how many we don't need. A practical test would be to look at how you use your pictures. When did you last make an A3 print, or even a 7x5in photograph for an album or to send to someone? If 7x5in is as big as you ever print, you don't even need 4 million pixels – though you'd be pushed to find a camera that could supply that few these days. The maths says best-quality demands 300 pixels for every linear inch of the print you are making – 3000x2400 pixels for a 10x8in, for example. But when did you last print anything? If your images only ever appear on a screen or online, even on sites where they can be viewed full-screen, you really don't need more than 8 million – and that's only for 4K viewers with big TVs. It is fair to say though that few of us buy the number of pixels we need – we buy the number we want. The narcotic lure of the Canon 5D III's 22-million-pixel sensor, the 36-million of the Nikon D810 and the incredible 51-million of the Pentax 645Z is powerful indeed. Still, after all these years of knowing that more pixels doesn't always lead to better pictures and that in reality a 16-million-pixel sensor is sufficient for most of us, many can't help but swoon and salivate with desire. Hearing about these high resolution sensors is sometimes enough to set photographers spinning into a fantasy land – imagine what I could do with all those pixels – where the scale of the dreamt-about reproductions inevitably exceed what will ever become a reality. We like to dream, and we like to be ready for when those dreams are realised. When the situation arises that demands our best images be exhibited on 8-foot panels, we'll want to know that they will look as good as they can. Whether that day ever arrives or not, hardly matters: we want to know that we will be prepared. And we will continue to prepare by upgrading our cameras beyond the moment we realise a 16GB card holds only 36 exposures. If we were professional photographers, and had to account for and commercially justify what we spend, we would do the maths to find the true pixel-count we need for the biggest jobs we deal with. The wonderful thing about being amateur is that we don't have to justify anything. We take pictures for fun and we look at them for entertainment - we can justify any excessive pixel count so long as we enjoy using that many pixels and inspecting the detail that they can record. If your aim is to enjoy photography, rather than simply to make prints big enough to satisfy other people, then the scientifically correct pixel count for your photography is precisely that which makes you happy. And ignore anyone who tells you differently.